Grand Central Publishing, 9781455578528, 336pp. The importance of money in our lives is readily apparent to everyone--rich, poor, and in between. However grudgingly, most of us accept the expression "Money makes the world go round" as a universal truth. We are all aware of the power of money--how it influences our moods, compels us to take risks, and serves as the yardstick of success in societies around the world. Yet because we take the daily reality of money so completely for granted, we seldom question how and why it has come to play such a central role in our lives. 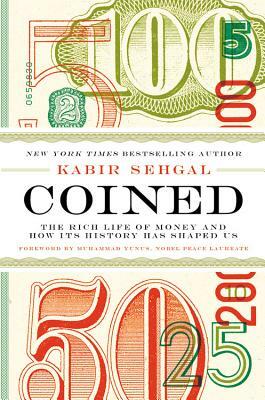 In Coined: The Rich Life of Money And How Its History Has Shaped Us, author Kabir Sehgal casts aside our workaday assumptions about money and takes the reader on a global quest to uncover a deeper understanding of the relationship between money and humankind. More than a mere history of its subject, Coined probes the conceptual origins and evolution of money by examining it through the multiple lenses of disciplines as varied as biology, psychology, anthropology, and theology. Coined is not only a profoundly informative discussion of the concept of money, but it is also an endlessly fascinating and entertaining take on the nature of humanity and the inner workings of the mind. Kabir Sehgal is a vice president in emerging market equities at J.P. Morgan in New York. He serves as an officer in the United States Navy Reserve, served as a speechwriter on a presidential campaign, and is a term member of the Council on Foreign Relations. He is the New York Times bestselling author of books including Walk in My Shoes (with Andrew Young) and Jazzocracy. A Grammy-winning producer who has performed with Grammy-winning musicians as a jazz bassist, he co-founded an arts organization which merged with the Afro Latin Jazz Alliance. Sehgal is a graduate of Dartmouth College and the London School of Economics.